﻿ What Materials are best for excluding bats? What Materials are best for excluding bats? Some bats happen to find buildings much more attractive than good old trees to spend their happy lives in. Well, not exactly, but bats do tend to start residing in some buildings although, of course, the reason is not quite as freaky as stated earlier! Naturally, bats like to spend summers in large, preferably dead trees. But quite often these days, the continuous logging practices and rapid deforestations leave the poor bats no choice but to look for alternative options. In such a case, a bat can do no better than a shabby house in disrepair or poor condition. The reason for this is simple. Old buildings tend to have plenty of easy access holes and gaps, and a lot of crevices which provide protection to the bats. The “Easy Access Holes” can be difficult to notice as bats can pass through a crack as small as 4/10th of an inch! Bats tend to make their home in the attic quite a lot. One or two bats in the attic might go unnoticed for a while as bats don't usually smell much and apart from the usual screeches and creeks, are pretty stealthy creatures. 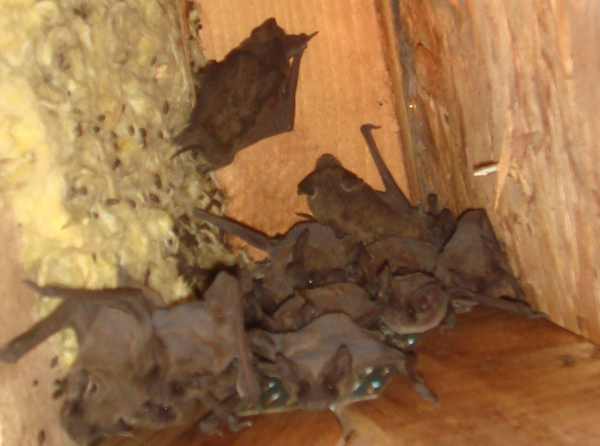 In the Bat guano, fungal spores grow which can cause histoplasmosis. This along with the fact that when in considerable amounts, the smell of bat guano and urine can be very unpleasant is why proper bat exclusion needs to be carried out. In U.S and Europe, it is illegal to trap or fumigate bats. The only humane solution to get rid of them is by “Live Exclusion”. What it means is to wait for the bats to leave the roost, and then seal up the entry point so they cannot access the building later on. For Live Exclusion, certain materials or “Exclusion Devices” can be used to facilitate this toilsome task. Some of the more commonly used are mentioned below. If the bat count isn't too great, then Funnels can be used. This is quite an easy way to go, but can't be applied effectively in many cases. But in cases, when the bats are leaving out through a small hole, funnels work the best. Another very convenient Exclusion device is the bat-cone. It also works very similar to a funnel basically but with a tapered body. It also has attachment wings for facilitating the process. They can be bought online with each costing $15 on average. A ¼ inch Poly inch netting acts as a very effective Bat exclusion device. Setting it up, in certain cases, can be a bit tricky but once properly set, the netting is highly effective and can be used for very large amounts of bats unlike some of the devices mentioned above. “DeWitt BB720DLX Deluxe Barricade Netting” is a 20 feet ¼ inch net that costs around $26 and can be used for Bat Exclusion. Normally, people try some other things generally only to find eventually that they were of no use. So here's a quick heads up on the few things that almost never work. Bright light can never scare away a colony of bats, noise is of no use either and general chemicals should be avoided too. Trapping and Relocating cannot do too good either because the bats can easily track their way back. Go back to the How to get rid of bats home page. How do bats drink water? Are bat feces dangerous to touch or breathe? What do wildlife rehabilitators do with bats? What kind of noises and sounds do bats make when they live in your house? If you need bats help, click my Nationwide list of bats removal experts for a pro near you.